I am always happy to be directed off the main parts of the high street down a side alley by a food chalk board. 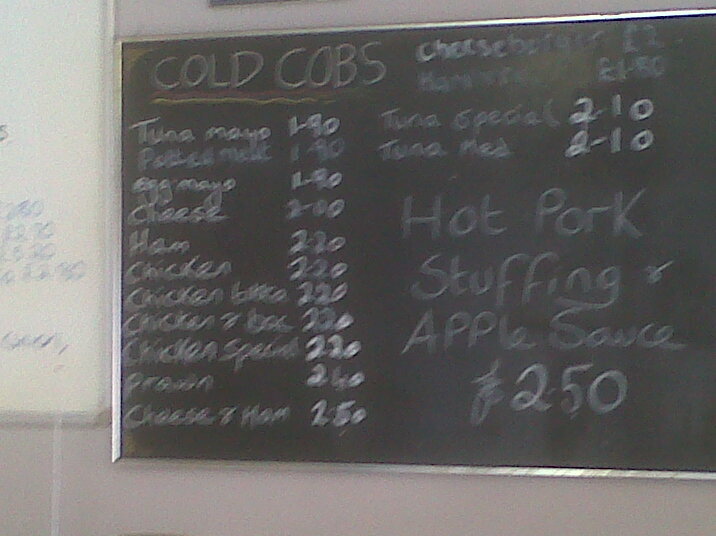 I am doubly happy when I see the words “Hot Pork, stuffing, and cob”. 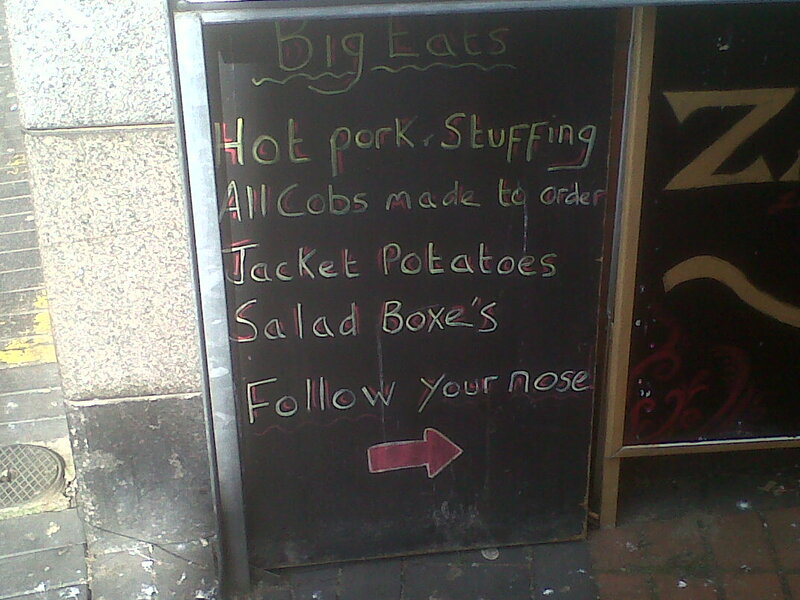 This week I was wandering around Bulwell and saw this board for the “Big Eats” shop and an arrow instructing me to ‘Follow your nose”. 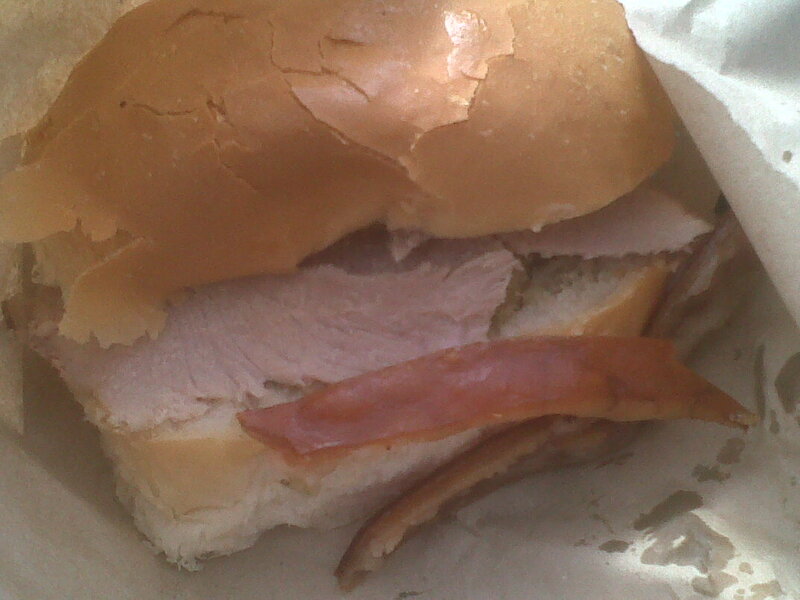 Well I was all over that, never one to turn down such simple direction I trotted off to find myself a pork cob. 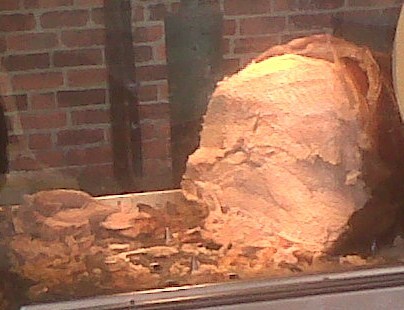 In the window was my Pork Cob in waiting, a nice big joint of Pork that had given itself up to many other peoples lunch before I arrived, had it fallen on its sword? or had it been defeated by the carving knife of the shop owner? Inside the chalk board was offering a Hot Pork cob with stuffing and apple sauce for £2.50. I ordered up one of those, declined the apple sauce, but asked hopefully if there was any pork crackling available? I was in luck and having handed over my handful of coins headed back out into the market place cob in hand to lunch. Once seated on a spare park bench I unwrapped my white paper bag to display my cob. It was a simple but tasty affair, soft white bap filled with plenty of freshly carved pork, some reasonable stuffing and some very (and I mean very) crunchy crackling. I liked this quite a lot. It was all gone within a few minutes and the sad pigeons looked up forlornly as I shook out the last few crumbs from the bag. work? I’ve virtually no expertise in coding but I had been hoping to start my own blog in the near future. Anyhow, should you have any recommendations or tips for new blog owners please share. I understand this is off topic but I just wanted to ask. Appreciate it!